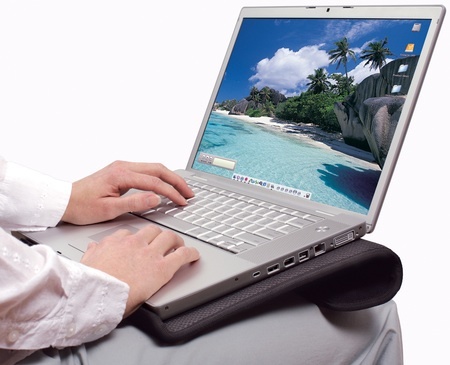 Round-up You've bought a shiny new laptop PC, MacBook or netbook. Pound to a penny, within a day you'll puzzling over one, two or maybe even three things: how can you use it on your knees while watching telly and not get warm lap syndrome? How can you set it at a better typing angle on your desk? And how can you stop the blasted fan from firing up every five minutes? A decent deskstand or lap rest is what you'll be wanting, so we've has rounded up ten of the best and planted a 15.4in Dell Inspiron, an Acer Aspire One, a 17in MacBook Pro and a four-year-old 15in Advent that runs as hot as Hades and fires up its fan at the drop of a hat on each to see which is the comfiest, most versatile and coolest - both literally and metaphorically. The iLap scores high in the comfort stakes due to its two felt-covered supports. The rear one is articulated, while the front one slides off to let the unit sit more securely on a desktop at a well-judged typing angle. The main part is made from aluminium, so it's light, sturdy and rather attractive. The tear-drop ventilation hole seemed unnecessarily small to us, but Rain bundles four self-adhesive rubber feet if the ones on our laptop have come adrift or you want to make some more airflow space. That big lower cushion also ensures your laptop will stay in place even when propped up at the most extreme angle in slob-out-on-the-sofa-with-knees-up mode. It's not cheap - while the smallest 12/13in version will set you back £45, the 15in costs £55 and the 17in model comes in at a whopping £60. This cheap, simple and one-size-fits all laptop stand from Allsop has a slightly raised and padded mesh base that provides cooling without requiring holes. It doesn't look like it works but in use it proved rather effective at keeping our old Advent cool. 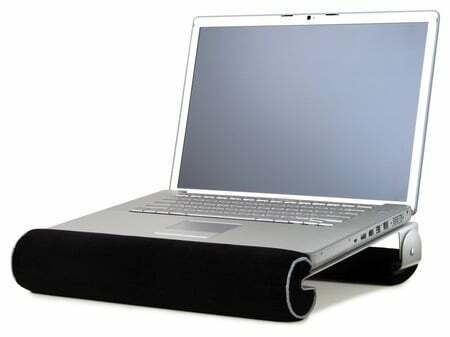 The Allsop's party trick is that you can flip it over and slide your laptop into the S-curve for transport and storage. This doesn't really work with anything bigger than a 15in machine but it does have an elastic retaining cord that was ideal for keeping our Aspire One in place, so we reckon this is the best netbook - rather than notebook - stand. Downsides? The front lip obscured the audio jacks and memory card slot of our Inspiron.